D-Rings vs Helmet Quick-Release Buckles: Are helmet D-rings safer? D-Rings vs Quick-Release buckles: Are helmet D-Rings Safer? 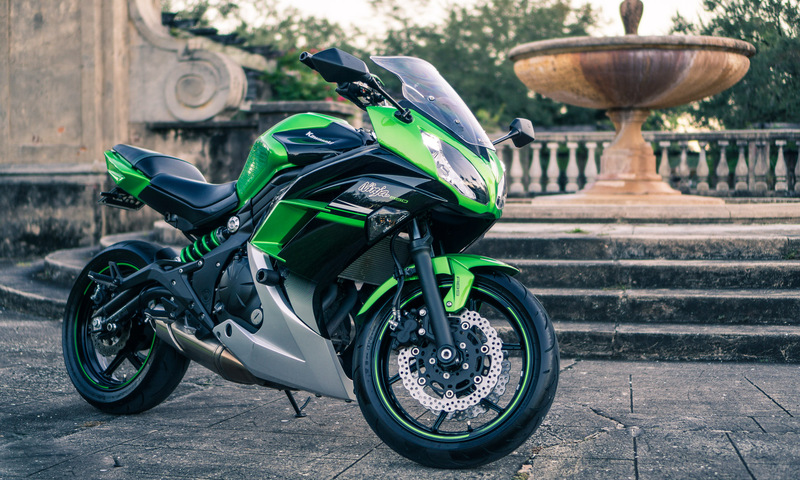 Many motorcycle riders take as gospel that helmet D-rings vs Quick-Release buckles, D-Rings are infinitely safer. But is that true? 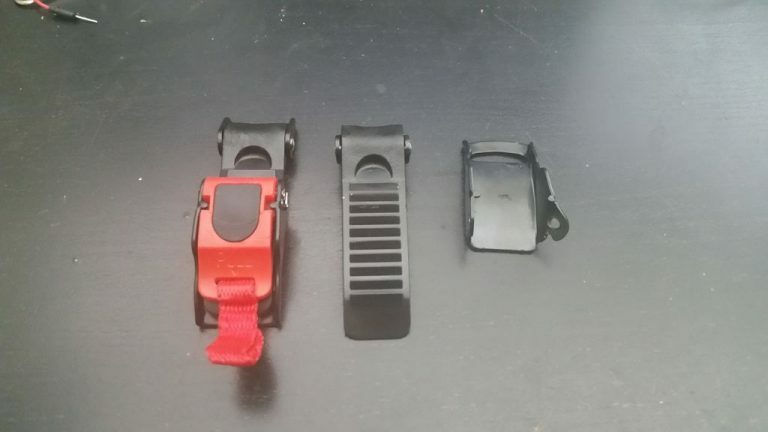 Namely, are quick-release buckles less safe than D-Rings? I won’t deny that helmet buckle D-Rings are absolutely tried-and-true. However, that doesn’t mean that Quick-Releases are an inferior choice. The question is, is one sacrificing safety for commodity with helmet Quick-Releases? I was skeptical about that. Given the lack of any proof either way, I thought I’d put it to the test. 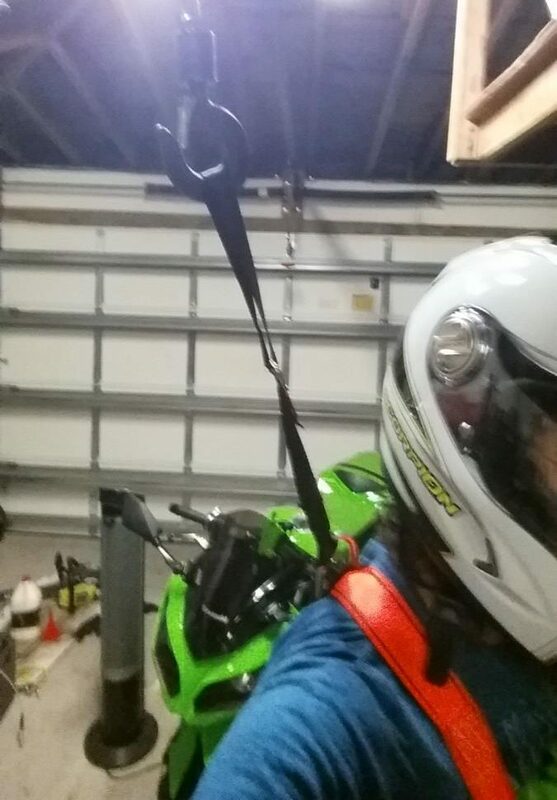 This all began after installing a DIY quick-release buckle on my helmet. A few emails and tests later, I found some very interesting results. While this post is far from scientific or rigorous (and shouldn’t be taken as such), it does provide some casual insight. If you’ve ever been curious about how helmet D-rings vs quick-release buckles compare safety-wise, keep reading. 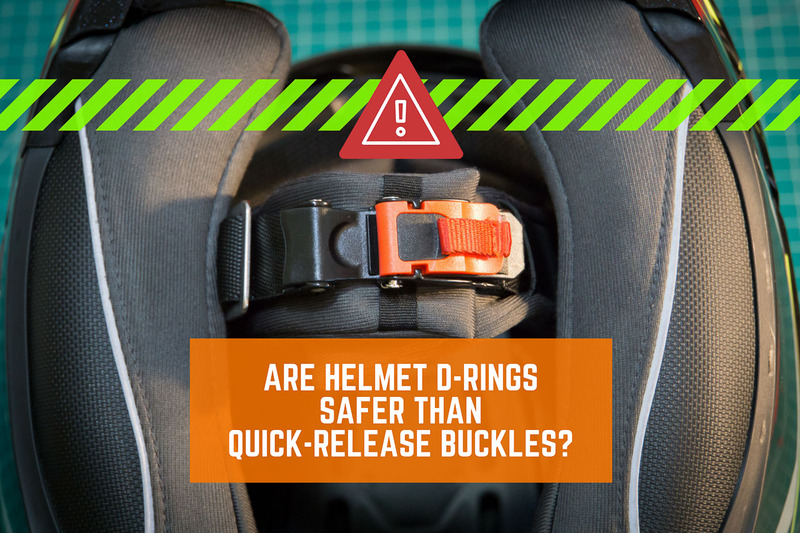 Are Helmet D-Rings Safer than Quick-Release Buckles? How does the DOT test helmet buckles? So the summarized conclusion? Regrettably, there is none. Or better said, there is no clear winner. Both should endure any accident you are likely to survive. For anything else, all bets are off. After the D-rings vs quick-release buckles testing, I still fully trust D-Rings. Although now it might not be dogma anymore. On the other hand, I don’t feel like I trust quick-releases any more or less than I did before. 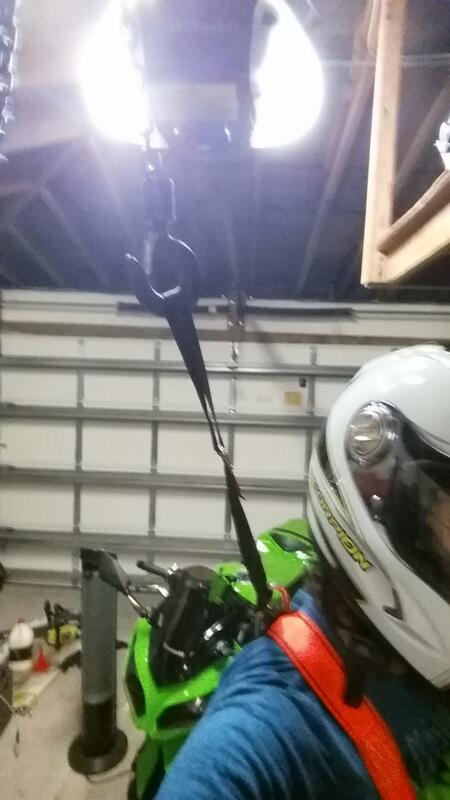 I still think that ratchet straps are better for casual street riding or a passenger unfamiliar with D-Rings. And sure, I’d go with D-rings on the track. Just in case. All in all, I don’t consider either option to be superior safety-wise. They will simply fail in different ways. Riders should just use whatever they feel more comfortable with. This is just food for thought for anyone curious about the matter. And if anybody has any other experiences, suggestions, or comments, feel free to fire away. I’d love to hear them. First of all, if you absolutely think that D-Rings are the safest and bestest thing a helmet can have, and the only thing you’d ever use, a helmet quick-release buckle retrofit isn’t for you. I won’t bother trying to convince you otherwise. Nonetheless, I still think that a helmet quick-release buckle is way more convenient for casual motorcycle riding. Yes, I know, you can thread D-Rings in seconds. And it isn’t a big hassle. I definitely agree. But some people, me included, enjoy the commodity of the quick-release for daily use. While it is true that most tracks only allow D-ring helmet straps, it’s hard to find evidence of that being due to anything more than tradition. As in proof of its superiority. You can hear anecdotal stories of helmet buckle failures both ways. Likewise, despite advancements in textile motorcycle gear, leather suits are also typically mandatory. Now of course, I enjoy the benefits of helmet quick-releases. But I don’t think that it should come as a safety compromise. Thankfully, a quick look at the market hints that that it isn’t an issue. 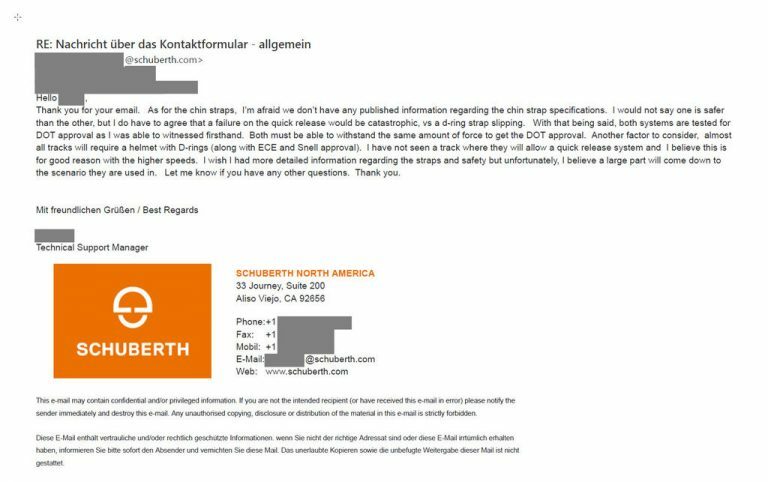 It’s true that helmet manufacturers for the US market don’t seem to be too fond of quick releases. But many European helmets have had a quick-release as the default buckle option for years. That’s including high-end helmets like Schuberth. Thinking they might be of help, I contacted them. Their technical support also had the opinion that either should be safe for regular riding. Not a big surprise, to be honest. But when it comes to the track, they seemed to speculate just like the rest of us mortals. To get some insight on the D-rings vs quick-release buckles topic, I emailed Schuberth’s technical support. If it’s good enough for Schuberth’s helmets, it’s good enough for me. 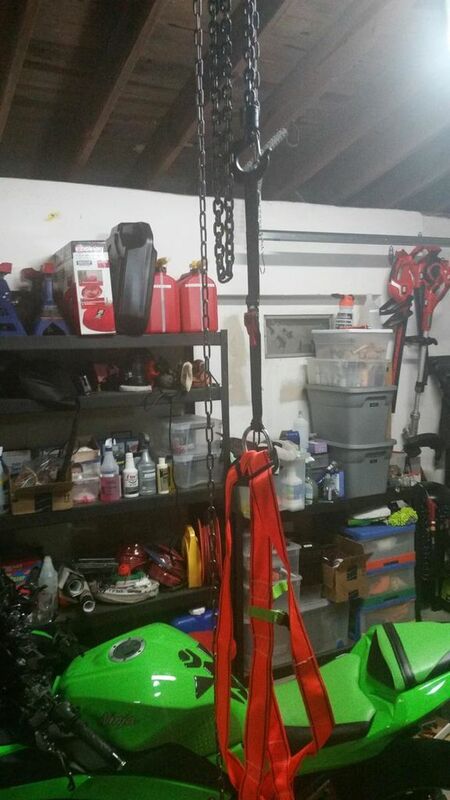 To compare the D-rings vs quick-release buckles, I grabbed a chain hoist and a harness. Don’t ask me how I thought this would be a good idea. It was one of those “Grab my beer” moments. First of all, I apologize for the image quality. When I did the tests I didn’t have putting them online in mind. 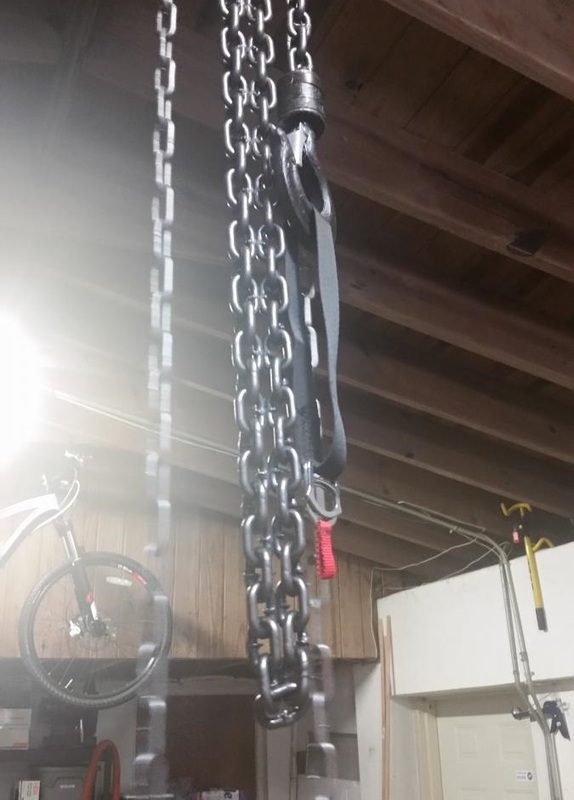 For the D-rings vs quick-release buckles comparison, I used a harness and a chain hoist to first test if the helmet buckles would hold my weight – 180 lbs. Then I tested whether it would hold the dynamic force of me jumping from a small height. The helmet is to avoid having the hoist hook or anything else bang into my head. Something likely if and when the helmet strap or the buckle snapped. In hindsight this was way too extreme a test, but oh well. It beats speculating. Regrettably, it turned out to be a flawed test for D-Rings. I sewed the buckles on to your typical cheap 1″ nylon straps. The type a helmet strap is generally made out of. The lengths of the strap were about 20 cm on both sides of the buckle. I’m not sure if that may have any relevance, since the strap does have a certain dynamic elasticity. In this case it wasn’t decisive either way since the strap was certainly stronger than the buckles. As I later found out, the main problem was the strap’s orientation. The biggest issue is that when strapped on, your chin keeps perpendicular tension on the buckle. Regrettably, there was no way for me to mimic that since I wasn’t about to become the first DIY martyr. Nonetheless, the fact that one buckle is so prone to slip does provide insight when comparing helmet D-rings vs quick-release buckles. The Helmet Quick-Release Buckle perfectly sustained my static weight repeatedly. It also supported my weight fine when I jumped from about .75-1 ft. Not unexpectedly, when I jumped from about 1.5-2 ft, it snapped. You can see the pictures below. The plastic component held perfectly without damage, but the metal body was bent where the pin snapped. It wouldn’t be all that hard to simply change the pin for a stronger bolt, but I’m not sure if I would be worth it anyway. Upgrading the metal pin would be a potential upgrade given how the buckle failed. Though considering how much force it took I can hardly blame it for giving in. But, does this mean anything in the real world? 180 lb falling from up to 2 ft causes a lot of force. Specially when a tiny pin is where all that force concentrates. By the way, the quick release didn’t slip before breaking. There were no marks on the teeth that would indicate that. And regardless, the way that it broke would have made it irrelevant. I didn’t try breaking any more quick releases. If nothing else, because I don’t have any way to quantify the applied force. Nor if that force was a “good” or “bad” result. But the test was interesting nonetheless. And seeing how much of a beating it took until it broke, I don’t have a lesser opinion of it now than before. Too bad I didn’t have the ubiquitous Echo Helmet Quick Release at hand to test. Given the lack of pin and odd design, who knows how it would have fared the testing. Even having used it for months in the past, I don’t dare guess. 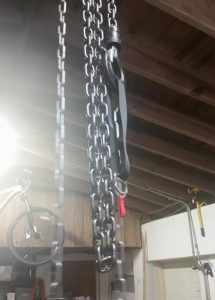 After the quick-release buckle, I tried a simple D-Ring setup. I expected it to hold as strong or stronger than the nylon strap. After all, D-Rings are the gold standard. Ironically, it didn’t. But mostly due to a flawed test setup. The problem is that the strap would slip extremely easy. I barely managed to load it with my weight once or twice before I quit. Despite what the YouTube stars would like you to think, not every experiment is successful the first time around. Nonetheless, I have absolutely no doubt it would hold the weight of my body perfectly in an ideal scenario. It’s just that this wasn’t it. The main problem is that the strap would “unthread” itself and slip out of the buckle. It would grab on, but any non-perfect loading of the buckle would lead to the D-Rings slipping. I could feel it consistently slipping before I was fully hanging. Once it was loaded, it wouldn’t slip. But it would try to slip as soon as I started to unload it. Even after threading the whole 20 cm it would consistently release before reliably testing it. In hindsight you might think this is obvious. And in hindsight, it is. But given how D-Rings are touted as the pinnacle of safety, I have to admit I was initially both surprised and let down. D-Rings will slip extremely easy if you don’t use them just right. Quick-Releases don’t have that issue. Either it’s clipped in or it’s not. Whether this is realistic or not in the real world is anyone’s guess. But people have had accidents due to D-Ring strap slipping off their heads, so it isn’t that far-fetched. However, I have a deep suspicion that none of this matters anyway. Who cares if the helmet buckle would survive, if your neck breaks in the process? Both buckles easily supported my body-weight. And imagine someone trying to pull my helmet/head off with an equivalent weight of 180 lbs. Much less 180 lbs applied dynamically. Or more precisely it’s perfectly obvious what would happen – and it wouldn’t be pretty. While both buckles failed, I’m not sure they failed before “lethal or otherwise irreparable harm”. And this comes to the second point. I’m unsure of what type of forces a strap has to face in the first place. It surely has to stop the inertia of a 2-4 lb helmet decelerating at whatever speed you have the fall at. Something it can trivially cope with. Besides that, the whole point of a helmet is to protect your head from impacts. When impacting against something, aren’t most impacts likely to try to compress the helmet on your head further, rather than trying to rip it off? In that situation, the helmet D-rings vs quick-release buckles debate isn’t very relevant. I really just can’t imagine any non-lethal scenario where one would have the equivalent force of a grown man trying to hang off your head. Obviously this is pure speculation – I know nothing about the forces which take place during an accident. On the other hand, I can imagine a helmet and head bouncing on concrete, where the load applies and releases repeatedly in a small interval. After this test, I’m not sure the D-ring shines in that situation anymore. That’s not to say it would fail, but a minor degree of slippage is a definite concern. Out of curiosity, I checked to see if there were online references to what the exact requirements are for certification. Apparently it is public. I just wish I would have seen it prior to doing my own little experiment. 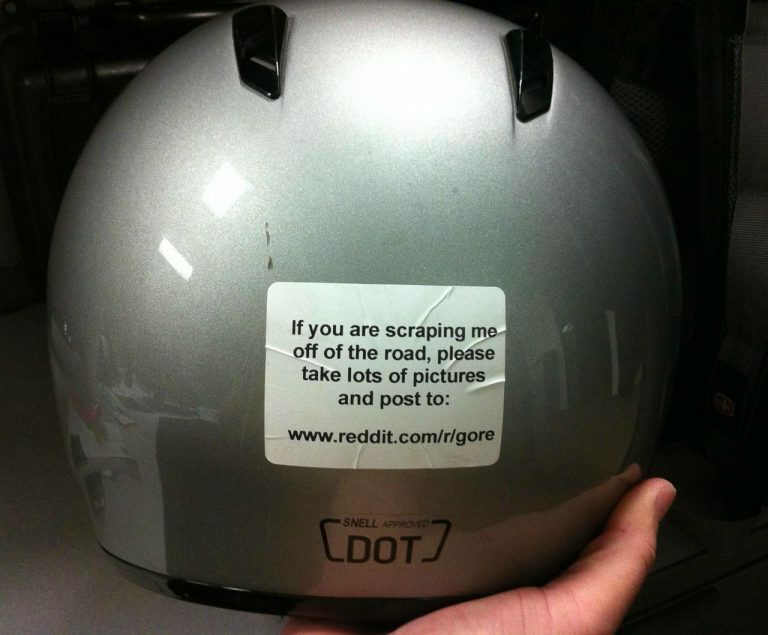 The following is how the DOT tests helmet retention systems. Keep in mind that when it comes to helmet D-rings vs quick-release buckles retention, they make no distinctions. 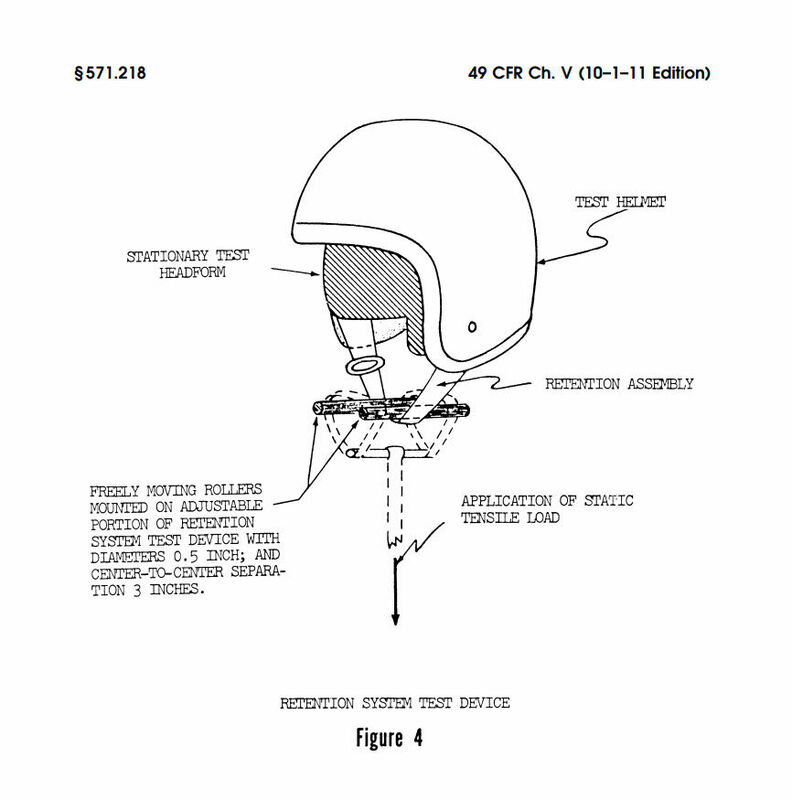 Per “Dot Regulations for Retention System”, this is how helmet retention systems are supposed to be tested. S7.3.1 The retention system test is conducted by applying a static tensile load to the retention assembly of a complete helmet, which is mounted, as described in S6.3, on a stationary test headform as shown in Figure 4, and by measuring the movement of the adjustable portion of the retention system test device under tension. S7.3.2 The retention system test device consists of both an adjustable loading mechanism by which a static tensile load is applied to the helmet retention assembly and a means for holding the test headform and helmet stationary. The retention assembly is fastened around two freely moving rollers, both of which have a 0.5 inch (1.3 cm) diameter and a 3-inch (7.6 cm) center-to-center separation, and which are mounted on the adjustable portion of the tensile loading device (Figure 4). The helmet is fixed on the test headform as necessary to ensure that it does not move during the application of the test loads to the retention assembly. S7.3.3 A 50-pound (22.7 kg) preliminary test load is applied to the retention assembly, normal to the basic plane of the test headform and symmetrical with respect to the center of the retention assembly for 30 seconds, and the maximum distance from the extremity of the adjustable portion of the retention system test device to the apex of the helmet is measured. SS7.3.4 An additional 250-pound (113.4 kg) test load is applied to the retention assembly, in the same manner and at the same location as described in S7.3.3, for 120 seconds, and the maximum distance from the extremity of the adjustable portion of the retention system test device to the apex of the helmet is measured. Honestly, the only thing made clear here is that Quick-Releases are a bit more reliable in certain situations. As much as anyone loves D-Rings, how easily it slips is concerning. Strength-wise, I have no doubt in my mind that D Rings are as strong or stronger than Quick Releases. But it does need loading in a specific way to avoid the helmet buckle simply sliding. Either way, considering how many riders out there forego helmets altogether – or worse, wear it but don’t fasten it – I’d just go with whatever feels more comfortable. In my case, that’s quick-release buckles for everyday riding. In hindsight, there would have only been one “good” answer when comparing D-rings vs quick-release buckles. And that would be the strap breaking before either of the buckles. If that happened, it would have pretty much proved that either is “good enough”. Having the Quick-Release break after a very strong and extremely localized impact doesn’t really mean anything. And having the D-Ring slip just means that it’s worthless for a non-constant “pulling apart” force like this. And that isn’t how you use a helmet. Which is the Best Bolt Grade for Swingarm Spools? Newsletter - Subscribe for updates! Wanna get notified when new content gets posted? Enter your email below to subscribe to updates and receive notifications of new posts by email. Support creators! A bit of motivation to keep creating content always helps! Consider making a donation to give a hand with the website’s upkeep. As an alternative, by purchasing items through any affiliate advertising links included, you can help me via a small referral fee at no extra cost whatsoever to you. For more info, click here. Electrical Repair - To Crimp or Solder? Motion Pro Cable Luber V3 Review – Oil your control cables! And who said millennials didn’t know how to get their hands dirty! I’m just a guy who doesn’t know when to quit, and is constantly in search of a solution to a problem that doesn’t exist yet. Check in to see my latest articles or projects.